These under tank heating pads come with rubber feet. 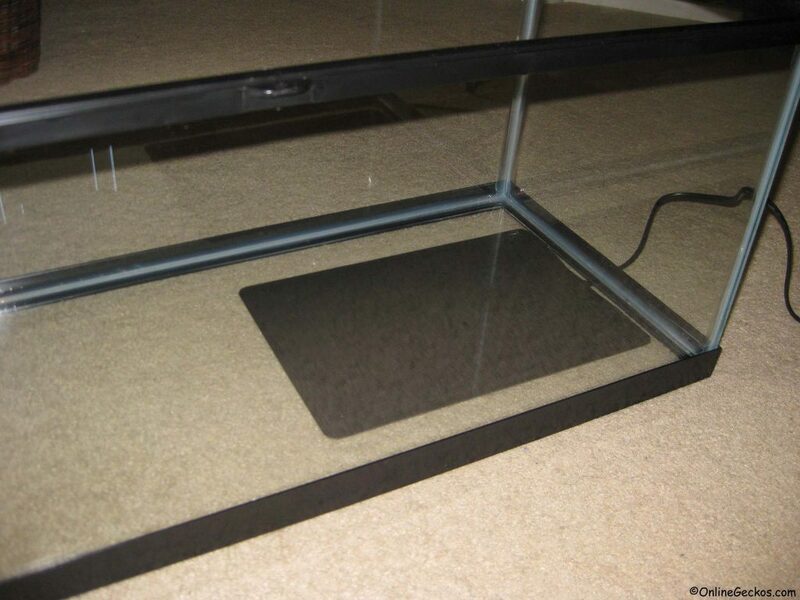 You want to stick the rubber feet on the 4 corners under your tank. This will lift the tank up so your UTH isn’t laying flat on the ground. 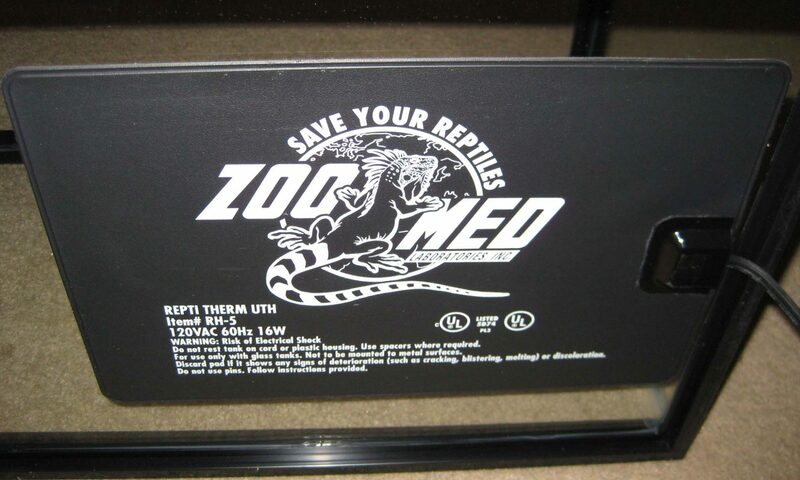 This gives your heating pad air flow, preventing it from overheating or causing damages to the surface the tank sits on. Once you have your UTH setup, and have placed your tile/decor inside, it is highly recommended you purchase a thermostat to help you temperature control your under tank heating pad. The best thermostat we’ve used is called Hydrofarm Jump Start MTPRTC Digital Thermostat. It is a non-proportional thermostat with digital readings, and it costs around $30. You won’t find another thermostat with the same features at lower price. Plus it has raving reviews on Amazon, thousands of people have used it and confirmed it is a great, reliable digital thermostat. We highly recommend it. The way you use a thermostat is by plugging your UTH into the thermostat. Then lower the probe on the thermostat down to the terrarium floor above where your UTH was installed. You’ll want to keep the probe taped down or held down with an object inside the tank. This probe will monitor the temperature your UTH gives off inside the tank floor, where your leopard gecko will be laying on. The purpose of this is so you can forget having to check your tank’s floor temperature all the time. The digital thermostat will adjust the temperature for you, providing your geckos with safe level of belly heating. This can prevent burns and deaths in case your under tank heating pad malfunctions or gets too hot. A common mistake gecko hobbyists make is by purchasing a gecko kit from retail stores. These kits often come with stick on thermometers, where you stick it on the side of the tank and it’ll tell you the air temperature. Since leopard gecko heating requirement is different, they use belly heat instead, air temperature doesn’t matter as much. You need to know what their belly temperature is, which is why having the digital thermostat probe on the tank floor is important. You want to set your temperature to between 88-93 degrees Fahrenheit, 90 degrees being the sweet spot but leopard geckos are fine with belly heating between the 88-93 degrees range. A quick and easy way to double check your tank’s floor temperature is with a temperature gun. Etekcity Lasergrip Digital Laser Infrared Thermometer allows you to point and instantly get temperature reading on your tank floor’s surface. It’s a great way to double check your temperature setup with your UTH & digital thermostat. This is a time saver if you have multiple tanks! Etekcity Lasergrip 1080 Digital Temperature Gun is the same one we use here at OnlineGeckos.com, Amazon’s #1 Best-Seller. Ideally you want to have a good temperature gradient inside your tank for your leopard gecko. The warm side, which covers roughly 1/3 of your tank, should be between 88-93 degrees on the tank floor. The cool side should be your room temperature in the 70’s. Having a temperature gradient allows your gecko to move around as they please. You’ll find them move to the warm side when they need to digest food or to warm up after a night of sleep. Then when they need to cool down and just relax, they’ll move to the cool side. This is also why you want to provide 3 hides for your gecko. A hide on the warm side, a hide on the cool side, and a moist-hide somewhere in the middle. This way your gecko can relax inside a hide if they wish to. 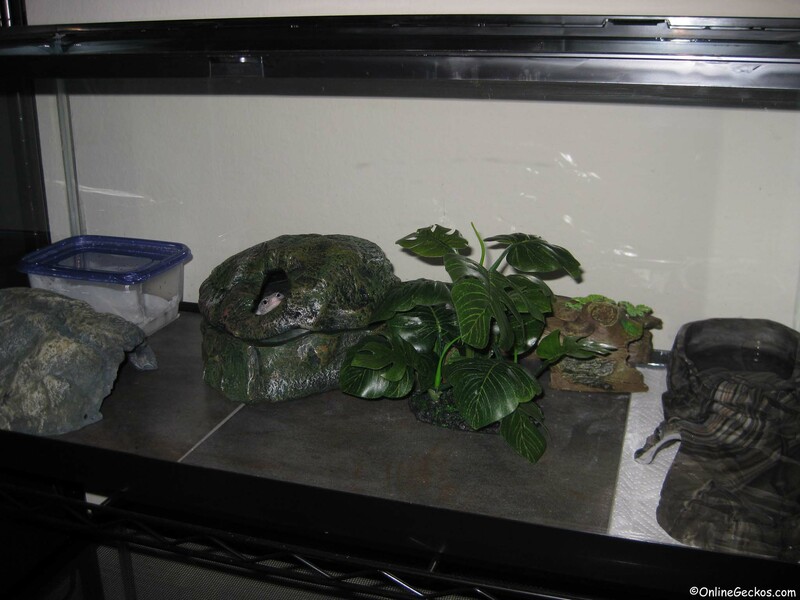 Here’s an example tank we’ve setup, with warm hides on the left, a moist-hide in the middle where the gecko’s head is poking out, and a cool hide on the right. While air temperature isn’t important, it is a cause of concern if your room temperature gets consistently under 70 degrees Fahrenheit. In this situation, you can add supplemental heating using a Ceramic Heat Emitter (or CHE). This will help you raise the tank’s air temperature. But only use this under extreme circumstances because CHE’s can get very warm. You will only ever need to consider using a ceramic heat emitter if the room gecko is in gets below 70 on a consistent basis. 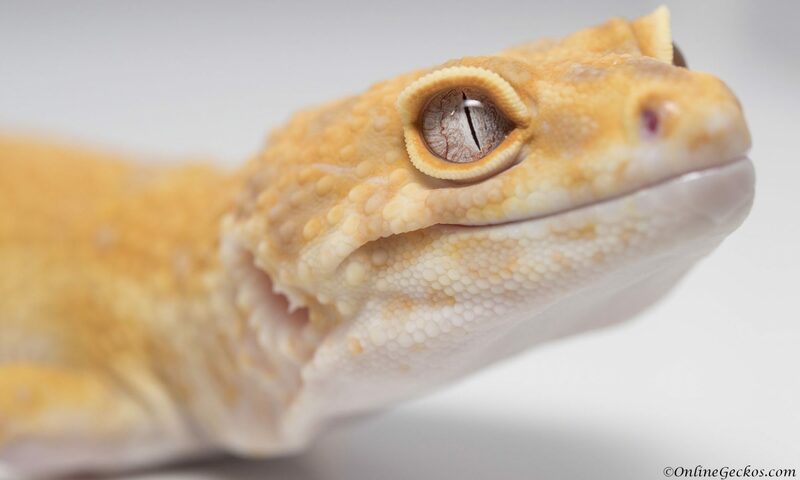 Ceramic heat emitters emit heat without light, so it’s ideal for leopard geckos. You can adjust the amount of heat output inside the tank by raising the CHE higher above the tank. Never create an oven-like environment, even on cold days leopard geckos need cool spots to sleep in. So do not overheat the tank and don’t let CHE destroy temperature gradient inside the tank. 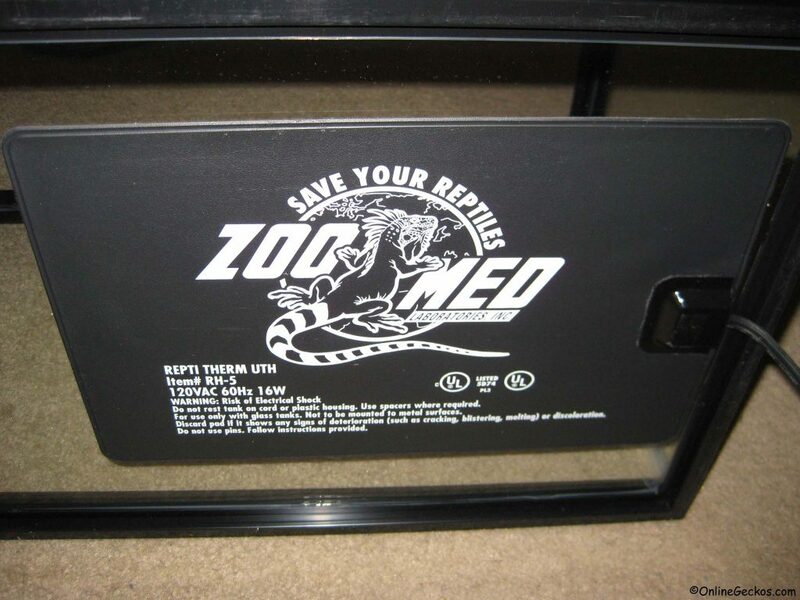 This pretty much covers all you need to know with regards to your leopard gecko heating and temperature needs. This article applies to both leopard geckos and african fat-tails. Remember leopard geckos are not diurnal, they do not require basking light, nor do they enjoy having a bright light shine on them every day. Crepuscular species like leopard geckos enjoy fading light, they can’t see very well when it’s bright. Now you may have questions about your gecko’s calcium needs. Your gecko can get their calcium needs by proper diet supplements, which is a whole other discussion in itself (you can read the full comprehensive feeding and supplementing guide here). The short of it is that you would gutload your feeders properly, then dust your feeders with a multivitamin supplement such as Repashy Calcium Plus, which includes vitamin D & calcium. The vitamin D will allow your gecko to absorb calcium, therefore your gecko does not require a basking light. Diurnal species like iguanas and bearded dragons use UVB from basking light to synthesize vitamin D, which then allows them to absorb calcium. Two different species function differently and they live different lifestyles. Don’t confuse the two. We hope this helps clear up some questions and misinformation out there. We wish you and your geckos happy and healthy lives! Click here to read a full comprehensive leopard gecko care guide. Previous PostPrevious What should I breed? What morphs do I make? What to sell? What breeding projects?